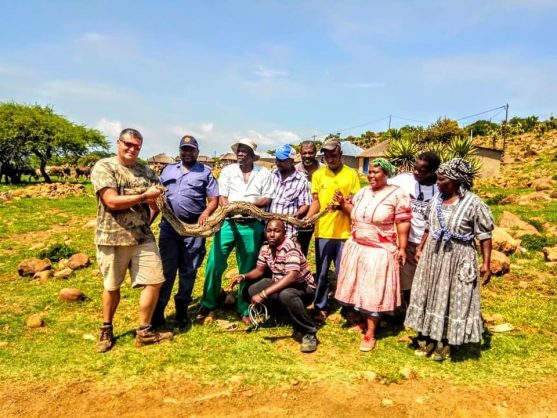 Community members tentatively pose for a photo with the Southern African python. Frightened community members watched in anticipation while a snake expert managed to get the creature under his control. A massive Southern African Python was recently found in the Mcitsheni area by local snake expert Fanie Cilliers, reports Ladysmith Gazette. He was contacted by Ezakheni police and notified of a snake eating a lamb. Police escorted Fanie to the homestead in question, as this is the first time a snake has been removed from this area. The approximately four-metre-long snake was stuck in a fence due to the size of its stomach after eating the lamb. Fanie quickly went in and safely removed the snake. Frightened community members gathered around and watched while he managed to get the creature under his control. The python was released at Nambithi Private Game Reserve, where it will have an abundance of food to eat.